I am a paper artist and my love for detail, color, and dimension keep me sane while I sit and cut paper. 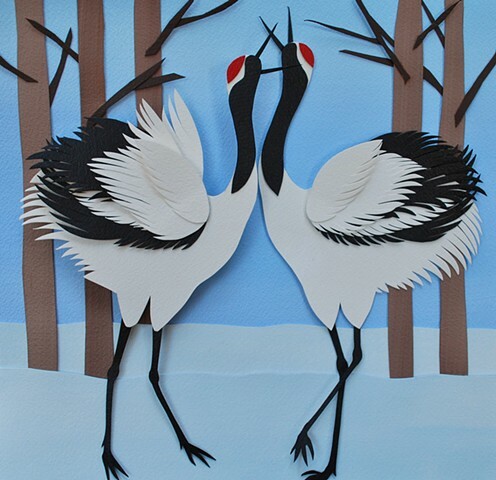 Each piece of artwork is made up of hand cut painted paper. I paint sheets of watercolor paper with "Golden" brand acrylics and cut each detail out, by hand, with scissors. I repaint all the white edges to make the piece bold and vibrant. The artwork is 3-D because of rolled paper and layering. Each piece is placed in a shadow box with at least 3/4" depth. All of my artwork is original. I will recreate any piece; however, no two pieces are identical because I change colors and details. Please contact me for any more information you may need.